WASHINGTON, D.C. -- The Corporation for National and Community Service (CNCS), the federal agency for service and volunteering, has deployed more than 200 AmeriCorps members, most of whom are part of the AmeriCorps Disaster Response Team, to areas of Iowa and Nebraska impacted by severe flooding. Previously, AmeriCorps members provided assistance in Missouri, and additional teams are on standby. In Iowa, more than 110 AmeriCorps members are deployed or activated. 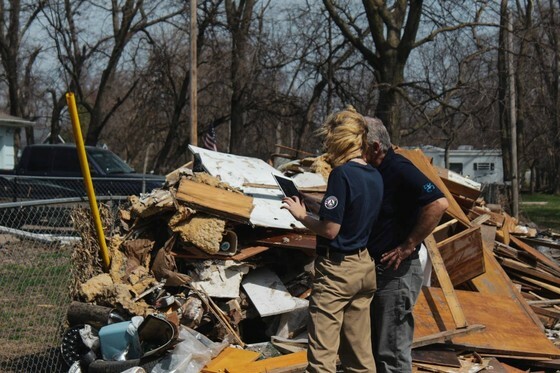 AmeriCorps members from Iowa and Minnesota have established volunteer centers and are beginning muck-and-gut operations, while AmeriCorps members serving with FEMA Corps are supporting the disaster agency directly with operations and survivor assistance registration. Additional AmeriCorps Disaster Response Team crews will arrive later this month. In Nebraska, where nearly 120 national service members are responding, two dozen local Senior Corps volunteers have been aiding the response efforts in the Omaha with disaster cleanup and at volunteer reception centers. 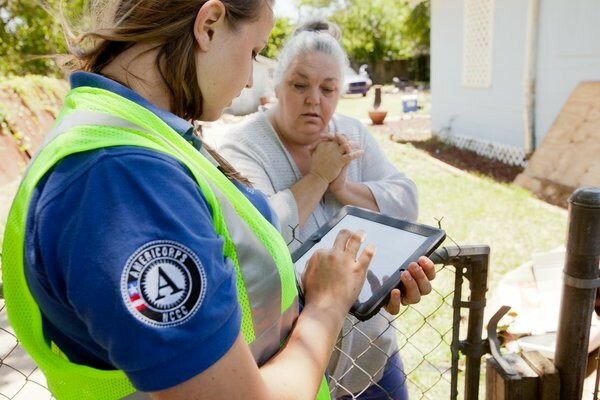 Approximately 35 AmeriCorps members serving with FEMA Corps are registering survivors for assistance, while nearly 40 members of the AmeriCorps Disaster Response Team are leading muck-and-gut operations, coordinating volunteers, and managing incoming donations. AmeriCorps Disaster Response Teams are expertly trained crews that provide support for shelter operations, call centers, volunteer and donation management, muck-and-gut operations, blue-roof tarping, and debris cleanup, among other services. This response also includes AmeriCorps members of FEMA Corps, an innovative partnership to enhance the nation’s disaster response and recovery capacity, while expanding career opportunities for young people. Working closely with FEMA, CNCS is coordinating with state and local authorities to monitor and assess additional resources needed within the community. In addition, the agency is working with Serve Nebraska and Volunteer Iowa, the State Service Commissions responsible for implementing national service programs across the state. CNCS provides strong support, expertise, and trained and dedicated volunteers to help communities to prepare for, mitigate, respond, and recover from natural and man-made disasters. From forest fires and floods, to hurricanes and tornadoes, to terror attacks and oil spills, participants in CNCS programs have provided critical support to millions of Americans affected by disasters since 1994. In the last two years, thousands of AmeriCorps members were deployed to areas impacted by Hurricanes Harvey, Irma, Maria, Florence, and Michael. The agency still has active resources in many of those regions. When emergencies happen in rural communities, especially disasters that are severe or prolonged, the demands on local response agencies and healthcare facilities can quickly consume available resources. Disasters have complex effects, whether they are natural or man-made, and can occur without warning. As stated in the Federal Office of Rural Health Policy's document Rural Communities and Emergency Preparedness, rural communities preparing for and responding to emergencies depend on assistance from healthcare facilities, local public health departments, law enforcement, fire departments, and emergency medical services (EMS). Some rural areas lack local public health departments and instead rely on state public health agencies. Where rural local public health departments do exist, many operate with small budgets and limited staffing. Similarly, many rural hospitals face their own financial challenges and resource constraints. As a result, rural local public health departments and hospitals may lack the capabilities to respond adequately to emergencies, leaving communities vulnerable. Rural residents can collectively decide to implement a whole community approach to emergency preparedness and assign community members' tasks and responsibilities based on knowledge, strengths, and abilities. For more information and resources on rural public health agencies and the challenges they face, see RHIhub's Rural Public Health Agencies topic guide. What is the difference between emergency preparedness and emergency response? What are some challenges in rural emergency management? Who should be involved in emergency preparedness and response in rural communities? How can community members be engaged and trained in disaster preparedness and response? How do disasters in urban areas affect rural communities? How can rural communities prepare? What resources are available for communication planning in a rural area? How can rural hospitals and other healthcare organizations prepare for disasters and large-scale emergencies? How can rural communities plan for addressing residents' mental health needs after a disaster? Our community has experienced a disaster. Where can we get help? What disasters are more likely to affect rural areas? What are the emergency preparedness requirements for rural healthcare facilities? Emergency preparedness refers to actions performed before an emergency. Examples can include planning and coordination meetings; writing communication or standard operating procedures; training staff, volunteers, and community members; conducting emergency drills and exercises; and ensuring that emergency equipment is available, in good repair, and ready to use. Emergency response refers to actions taken after an emergency or natural disaster to help minimize the negative effects. Examples can include emergency communications; coordinating first responders and volunteers; providing emergency medical care to injured; coordinating temporary shelter for evacuated or displaced survivors; and organizing supplies and equipment for those assisting in and affected by the emergency or disaster. Strong relationships between people and organizations within a community, and a willingness to volunteer, may help compensate for some challenges rural communities experience during emergencies. The Institute for Rural Emergency Management(IREM) provides technical assistance to rural communities and can help with training, hosting workshops, and more. IREM conducts research in and shares best practices between rural community and emergency preparedness and response managers and professionals. Many community members are responsible and should be involved with emergency preparedness and response for their rural community. Partnering to Achieve Rural Emergency Preparedness: A Workbook for Healthcare Providers in Rural Communities describes effective emergency preparedness and response planning as the coordination and communication across regions and numerous types of organizations, including healthcare facilities and service organizations. Rural healthcare providers and organizations should be familiar with local-, regional-, and state-level emergency management systems. Building professional relationships with key personnel in various health-related or civic organizations and government agencies will better position rural healthcare providers to work effectively and efficiently in the event of a disaster. Examples of these groups can include local and state health departments, primary care associations, behavioral health facilities and agencies, clinics, long-term care facilities, correctional facilities, law enforcement officials, first responders, and disaster relief agencies. The Rural Domestic Preparedness Consortium (RDPC) offers rural specific training and resources for emergency responders. Free courses are available in-person and online, and are certified by the Department of Homeland Security. You can view the training schedule and course catalog online. RDPC utilizes an all-hazards approach for emergency preparedness and response training to prepare responders for many types of emergencies, threats, disasters, and hazards. The Public Health Foundation coordinates the TRAIN Learning Network, which provides education, training, and resources to professionals at little or no cost. 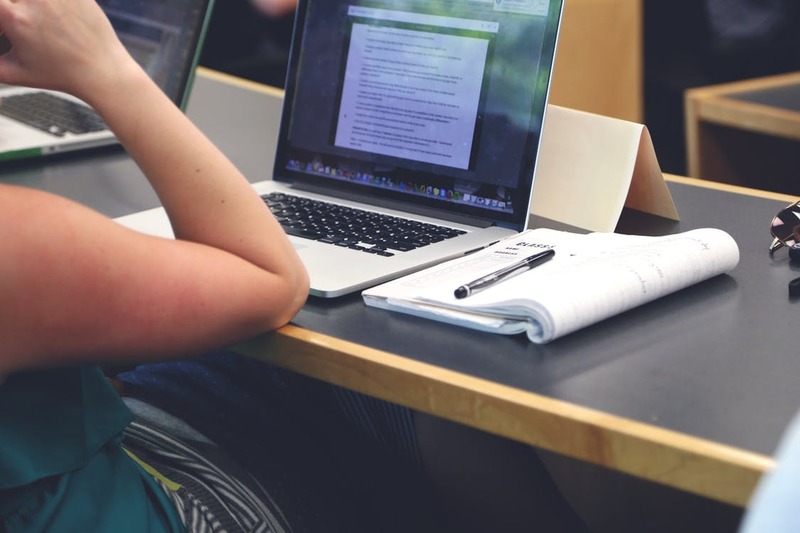 You can narrow your search of available courses by rural, course format, date, selected public health competencies and capabilities, and more. To be well prepared, it is important to connect with emergency management officials both at the county and state level. To find your state emergency management agency, see the Federal Emergency Management Agency's (FEMA) listing of Emergency Management Agencies. Your state agency can direct you to county, tribal, and local emergency management agencies. Ready.gov offers emergency preparedness and response information for those living in Indian Country. For more information on Native American health and wellness, see RHIhub's Rural Tribal Health topic guide. Community members can play an important role in a community's ability to plan, respond, and recover from emergencies and disasters. Community members can participate in planning efforts, receive training, and also serve as volunteers who support response and recovery efforts. CERT trained volunteers can provide immediate aid and assistance if professional responders are not available straightaway. They can also help emergency response agencies by supporting local emergency preparedness projects and planning. The Medical Reserve Corps (MRC) is a national network of local volunteer groups that engage communities to support public health, reduce vulnerability, build resilience, and improve preparedness, response, and recovery capabilities. MRC volunteers play a large role in building community resilience and preparing for and responding to disasters. MRC training is free, but registration is required. The MRC TRAIN course catalog and guide for new members is available online for community members to prepare and train for disasters. Another program offering training for community volunteers interested in assisting with emergency preparedness and response is provided through the Department of Homeland Security's website, Ready.gov. This platform provides emergency preparedness and response education and training resources for a variety of emergencies and disasters, such as flooding, power outages, fires, emergency alerts, active shooter situations, and more. Ready.gov also includes information and resources on Citizen Corps, a national network for state, local, and tribal members working to prepare their local communities for an emergency. The Center for Food Security and Public Health (CFSPH) at Iowa State University developed and maintains a website, All Hazards: Resources to Help Rural Communities Prepare for Disasters and Other Hazards, that offers guidance, resources, and assistance for agricultural communities to prepare for and recover from disasters and emergency situations, including dangers related to agrochemicals. In 2016, CFSPH published a guide, All-Hazard Preparedness for Rural Communities, for individuals, farmers, and businesses in rural agricultural communities preparing for an all-hazards approach for their communities and commodities. The National Association of County and City Health Officials (NACCHO) has a Rural Public Health Preparedness Collaborativeto connect with peers and share resources for public health emergency preparedness, response, and recovery in rural communities. Some state-level public health departments offer courses in rural emergency preparedness and response. To find yours, see the listing of State Health Departments. FEMA maintains a listing of state Emergency Management Agencies. These state agencies provide programs in homeland security, emergency management, emergency operations, conducting preparedness drills and exercises, hazard planning, strategic planning and community preparedness, and disaster recovery. Emergency preparedness and response planning tends to focus on the immediate needs of a community. However, rural emergency planners should consider the effect an urban disaster might have on their community. If residents of larger cities evacuate during an emergency or natural disaster, they would likely travel to or through rural areas. A 2014 NACCHO report, Responding to Medical Surge in Rural Communities: Practices for Immediate Bed Availability, offers guidance for ensuring 20% of hospital beds within a healthcare coalition can promptly be made available for high-needs patients in the aftermath of a disaster. The Rural Preparedness Planning Guide: Planning for Population Surge Following Urban Disasters, a rural preparedness guide from the NORC Walsh Center for Rural Health Analysis, offers case studies and worksheets to guide pre-event, event, and post-event population surge planning for rural communities. Public Health Emergency Preparedness and Response Capabilities: National Standards for State, Local, Tribal, and Territorial Public Health, published in October 2018 by the Centers for Disease Control and Prevention (CDC), describes the capabilities and functions of emergency preparedness and response standards. The 2018 CDC report highlights the importance of working with partners and stakeholders when conducting emergency preparedness and response planning, such as hospitals and other healthcare organizations. Rural hospitals are required to have emergency operation plans (EOPs) per CMS requirements. This is explained further below in What are the emergency preparedness requirements for rural healthcare facilities? Greater than 90% of hospitals in the United States use some form of the Hospital Incident Command System(HICS). HICS helps hospitals and healthcare professionals prepare for and react to disasters by establishing a clear chain of command. HICS can be used for hospitals of all sizes. The Missouri Hospital Association's report, Preparedness and Partnerships: Lessons Learned from the Missouri Disasters of 2011, is designed to offer guidance to organizations developing emergency preparedness and response plans. The Minnesota Department of Health published a bulletin, Information and Guidelines for Healthcare Facilities and Providers in the Event of Spring Flooding or Other Natural Disasters, outlining guidelines healthcare organizations and professionals can use to answer questions regarding standard operating procedures during an emergency or natural disaster. Another option for staff at rural healthcare organizations preparing for disasters and large-scale emergencies is to complete free, online courses from FEMA's Emergency Management Institute (EMI). A listing of EMI's independent study courses is available online. According to a research and policy brief from the Maine Rural Health Research Center, Encouraging Rural Health Clinics to Provide Mental Health Services: What Are the Options?, many rural areas experience shortages in mental health services and these deficiencies may become more pronounced after a disaster. A 2014 Public Health Reports article, An Academic-Government-Faith Partnership to Build Disaster Mental Health Preparedness and Community Resilience, notes that most disaster-related injuries and trauma are psychological, not physical. For that reason, it is important that rural communities plan and prepare before a disaster happens, so appropriate mental health services can be provided to those who experience mental health issues following a disaster. Rural healthcare providers may find they must tailor mental health services to the specific type of disaster their patients experienced. A Tale of Two Studies of Two Disasters: Comparing Psychosocial Responses to Disaster among Oklahoma City Bombing Survivors and Hurricane Katrina Evacuees., an article published in Rehabilitation Psychology,found that survivors of a mass casualty event were more likely to suffer from post-traumatic stress disorder, whereas the hurricane evacuees tended to need treatment for serious, persistent, preexisting psychiatric disorders. A fact sheet from the Disaster and Community Crisis Center at the University of Missouri, Mental Health Response to Community Disasters: A Fact Sheet for Disaster Mental Health Planners, Responders, and Providers, reviews the mental health implications of disasters and offers recommendations for mental health interventions. The Substance Abuse and Mental Health Services Administration (SAMHSA) provides resources for emergency preparedness, response, and recovery. In particular, SAMHSA's Disaster Technical Assistance Center (DTAC) helps states, territories, tribes, and local entities prepare to provide effective mental health services. SAMHSA also offers a Crisis Counseling Assistance and Training Program that provides grants and technical assistance to help individuals and communities recover from natural and man-made disasters through community outreach and access to mental health services. SAMHSA's 2014 publication, Tips for Disaster Responders: Cultural Awareness When Working in Indian Country Post Disaster offers suggestions for helping Native American disaster victims in a culturally sensitive manner. Public health departments may be able to provide some assistance after a disaster. To find your public health department or learn about services they can provide after a disaster, contact your state or territorial health department. Additionally, help may be available from the Medical Reserve Corps (MRC). MRC is a national volunteer network established to provide support for recruiting, training, and activating medical professionals, public health workers and officials, and community members, who are willing to volunteer after disasters and emergencies. FEMA offers the Disaster Survivor Assistance Program, and provides a listing of emergency management agencies and offices. See the Funding & Opportunities section of this topic guide for a listing of funding programs related to rural emergency preparedness and response. Other capital funding programs can be found on RHIhub's Capital Funding for Rural Healthcare Funding and Opportunities. The National Academies of Sciences, Engineering, and Medicine's 2015 report, Healthy, Resilient, and Sustainable Communities After Disasters: Strategies, Opportunities, and Planning for Recovery, offers guidance to improve infrastructure and delivery systems in a community after a disaster and can assist rural communities with the recovery process. Facility representatives must be able to provide documentation of emergency preparedness plan policies and procedures upon request, and be able to show where they are located. CMS requires the emergency preparedness plan is reviewed and updated on an annual basis. CMS provides emergency preparedness regulation guidancecontaining checklists and other resources to help surveyors, providers, facilities, and suppliers comply with the new CMS rule. This resource bank includes frequently asked questions (FAQs), names of healthcare coalitions by state, requirements by provider type, and a sample facility transfer agreement. WASHINGTON, D.C. – The Corporation for National and Community Service (CNCS), the federal agency that administers AmeriCorps and leads the nation’s volunteer efforts, has deployed members of the AmeriCorps Disaster Response Team and FEMA Corps, to Hurricane Michael impacted communities in Florida and Georgia. More than 175 AmeriCorps members from California, Colorado, Florida, Texas, and Washington crews will arrive in Florida in the coming days. Experienced in disaster response, they’ll immediately begin work, conducting damage assessments, making temporary roof repairs, removing debris and hazardous trees, leading muck-and-gut operations, coordinating volunteers. AmeriCorps members serving with FEMA Corps are supporting the agency directly with operations and survivor assistance registration. These AmeriCorps members join the hundreds who have deployed in response to Hurricane Florence. In the coming week, new AmeriCorps members from crews representing Arizona, Colorado, Iowa, Minnesota, Montana, Tennessee, Utah, and Washington will arrive, putting nearly 200 active boots on the ground. AmeriCorps Disaster Response Teams are expertly trained crews that can provide support for shelter operations, call centers, volunteer and donation management, muck and gut operations, blue-roof tarping, and debris cleanup, among other services. This response also includes AmeriCorps members of FEMA Corps, an innovative partnership to enhance the nation’s disaster response and recovery capacity, while expanding career opportunities for young people. Working closely with FEMA, CNCS is coordinating with its state partners, Volunteer Florida, the North Carolina Commission on Volunteerism and Community Service, and the United Way Association of South Carolina, the Governor-appointed state service commissions responsible for implementing national service programs in each state. Following a disaster, national service acts as a force multiplier, providing key resources and significantly expanding the capacity of existing organizations on the ground. In the last year, CNCS has deployed more than 5,000 AmeriCorps and Senior Corps members to areas impacted by Hurricanes Harvey, Irma, and Maria. From forest fires and floods, to hurricanes and tornadoes, to terror attacks and oil spills, participants in CNCS programs have provided critical support to millions of Americans affected by disasters since 1994. CNCS urges those wanting to get involved to wait for volunteer opportunities following the disaster. Those interested should consider cash donations to a recognized disaster relief organization. For more information and to follow national service disaster service developments, visit NationalService.gov/Disaster. Be Informed: Ready.gov provides free resources that prepare individuals and families of all ages to react and respond during extreme weather, social emergency, and natural disaster events. You Are the Help Until Help Arrives: What if you or a loved one are the first to arrive on the scene of a serious injury? FEMA's You Are the Help Until Help Arrives program features training modules and educational materials for all ages. Through this free resource, you can confidently provide critical help until help arrives. For a complete list of active online FEMA courses, visit this site. 2. Once you receive your SID, access the IS Courses by clicking the links above, or search for more FEMA courses here. and to obtain your certificate.